I have an extra post this week because it's Valentine's Day! This is the card I made for my husband. We have a weekend routine of sitting and having our hot drinks together in the morning. I have coffee and he has hot cocoa or tea. Even though he doesn't drink coffee, he still sits and drinks with me! The directions are the basic 4-1/4 x 5-1/2 inch card with a black card base, a white layer and a red layer using last year's DSP Valentine stack from Stampin' Up. I also cut the cups with papers from that stack. The cups are die cut using dies from My Favorite Things (Hot Cocoa Cups). 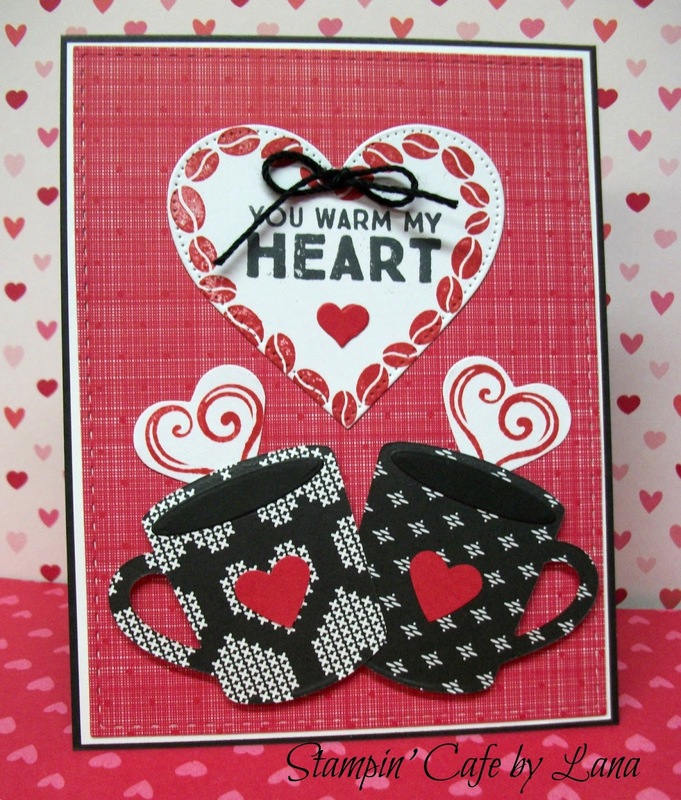 The "You Warm My Heart" is stamped with a My Favorite Things stamp set that coordinates with the Hot Cocoa Cups. 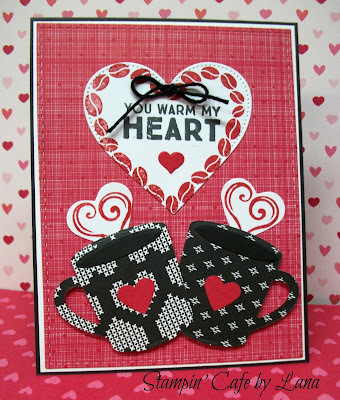 The coffee bean heart and "steam hearts" are stamped from a set by Sugar Pea Designs called Caffeine Addict. I cut the coffee bean heart out using a stitched heart die from My Favorite Things, and I punched out the steam hearts using a Martha Stewart heart punch. A cup, a cup, a cup, a cup, a cup (boy!)"